Wondering if anyone has tips or recommendations for making the most playable system. I have 7 rows of 84hp and it requires really long patch cables that could probably be fixed with a more square case. Having a bottom row that is parallel to the ground makes it difficult to read the setting when sitting a a desk. This could be fixed with some of the more curved cases that don’t go completely flat at the bottom. I have a doepfer base so the second row is at 45 degrees and some patch cables run into each other. This is partially because of module placement but I feel like a more curved case would also help this problem. Seen this one? It's about the only thing I can think of on the subject. For what it's worth I used to design control panels using ergonomic principles many years ago. The main thing you should avoid is reaching. I think some of the deeply curved high HP cases are too deeply curved. Possibly aesthetics over ergonomics but I've never used one. A relatively flat vertical panel is better with the top rows tilted if reach problems start to present. If you want to use a curve I suggest a gentle one. It's better to go a bit wider than too high, and keep in mind the right angled triangle formula, it's good for the hypotenuse to be about 75% of the longest cable you intend to use. 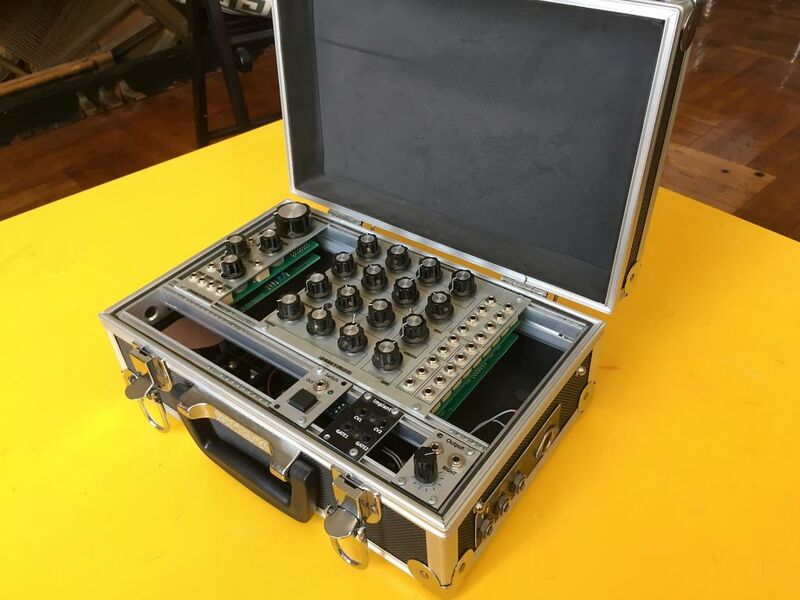 The benefit of flat/angled 6U base cases like the monster base case mentioned above is they are a balance of table space and providing stability. The issue of cables running into each other where modules meet at an angle is a serious one. It can render modules unpatchable. I’d recommend having 2 inches if possible between angled rows. If you put a bunch of mults at the center of your rig, you can cut the lengths of the longest cables in half. Put them up high. If you are a DIYer you can make up a panel of two jack jumpers. To keep a large rig ergonomic, curve it around you, not up and down. The vertical cases are raised ~3” from the table. Cables droop into the space and can be tucked under. The curve is nice, but thinking the bottom row would be good for controllers was based on no cables in the way. If I had it to do over again, I’d have an almost flat main case, slightly tilted back, with a skiff in front. 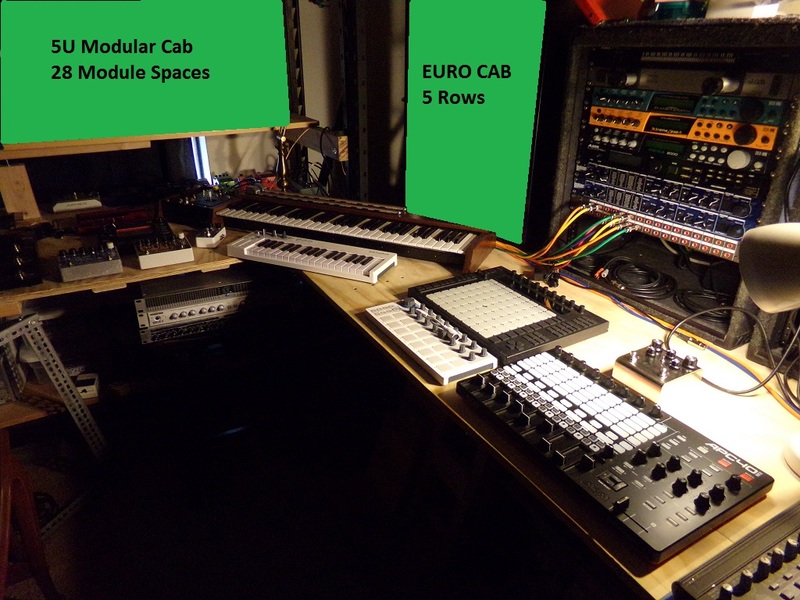 I've been looking at what is the best spacing on control knobs for custom synth modules and that pair of modules at the top with the LCDs to the left and sockets to the right look good. 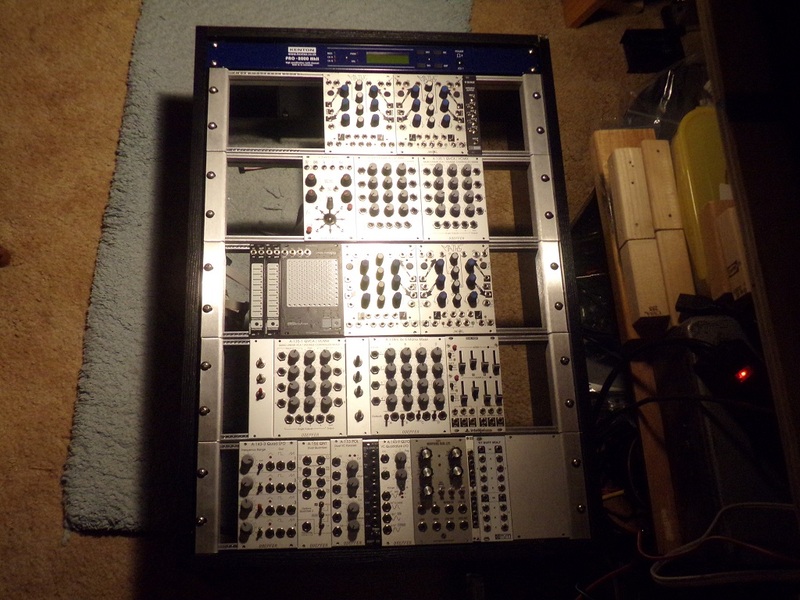 Does the poster or anybody else have this unit and could tell me the spacing of both the knobs and the jacks to the right ? He asked about knob spacing, not the model name of the module ... and while were on that topic it would help to add the manufacturer's name for those who don't know what "E370" means. tell me the spacing of both the knobs and the jacks to the right ? Knobs are best at no less than 1.000" center to center ... I typically use more than that however (usually 1.250" center to center). 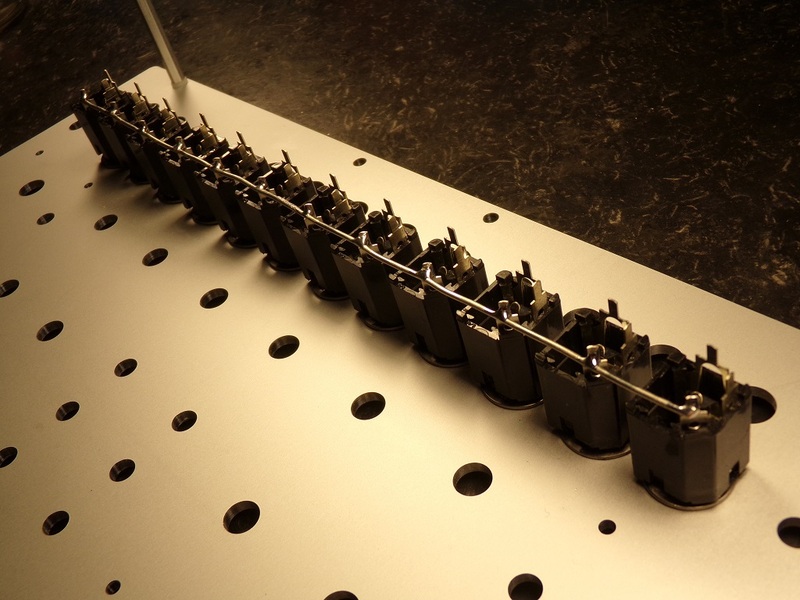 I place my jacks as close together as practical, with the particular Switchcraft enclosed jacks I use that comes out to 0.800 due to the stainless steel inside star lock washers I use which require the 0.800" center to center spacing between jacks. I design most of my own 5U panels and have Front Panel Express make them. Here's a picture of one example (a picture many folks have seen a number of times already) .... this panel is 12.75" wide by 8.5" tall (to give you an idea of the scale). If smaller knobs are to be used, a little less space from center to center may be designed in. I find 3/4" the absolute minimum I'll tolerate and that's when using 1/2" knobs. 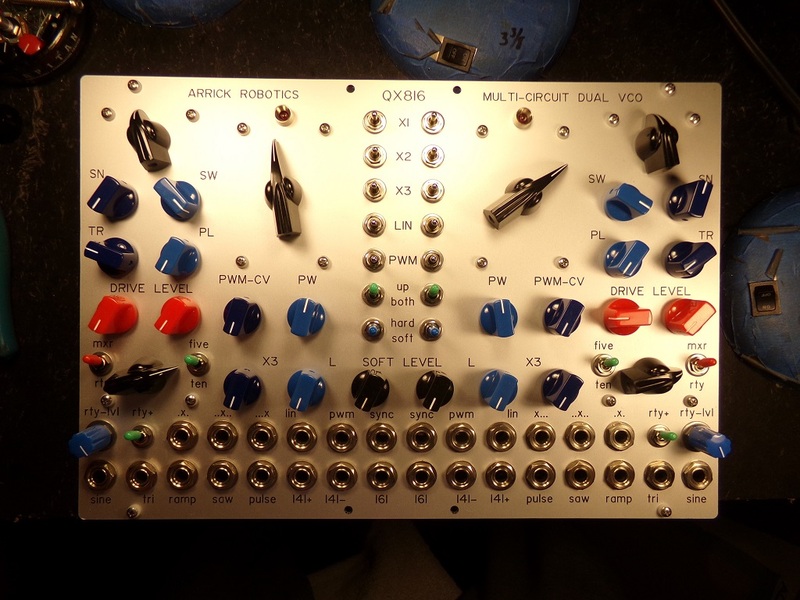 As can be seen in the bottom image I've pretty much redesigned my entire synth. It's not a studio queen, it's designed as a live performance synth where ~control~ is paramount and density takes a few spots down on the priorities list. Also note on all of the module panels I designed allll of the I/O jacks are along the bottom of the panels. That way patch cable plugs aren't getting in the way of my hands. My hands can sweep all the way across the synth without having to pull my hand back six inches to clear patch cables before I can move my hand in any direction. If patch cables are among the controls, when you move your hand from one knob to the next knob, you must draw your hand back away from the panels to clear the hairball of patch cables before you can move your hand in any direction ... and then you must stop movement aligned with the next knob you wish to turn and then move your hand straight in towards the panel in between patch cables to gain access to the knob or switch you wish to operate. So it's this out - over - in - operate the knob/switch .... then out - over - in - operate the next knob/switch. With all of the patch cables along the bottom of each panel, my hand can move from knob/switch to knob/switch without the out/in movement ... I can just sweep my hands straight from control to control ... just like when playing a performance synth (such as a Minimoog, or Monologue, or any other performance synth). There's more to "panel ergonomics" than just knob spacing. Oh I absolutely agree, especially as I'm looking at a live rig as well. Identifying what knob and socket spacing to use was just my first question, but you've answered lots of other things I was wondering about as well. Thank you very much for taking the time to make such a helpful reply. This is of interest to me as a potential new system builder. I need something portable that can sit at different angles depending upon where it lives. Thinking of the Rackbrute. Also interested in module placement, to follow the signal logically verses some other route. Not totally convinced on the Rackbrute and a lot of other portable Euroracks seem to have come and gone so obviously a niche market. I may just create something myself in a flight case similar to this. The flightcase does appeal, but doesn’t suit my needs unless I build a stand for it. Looks great though. 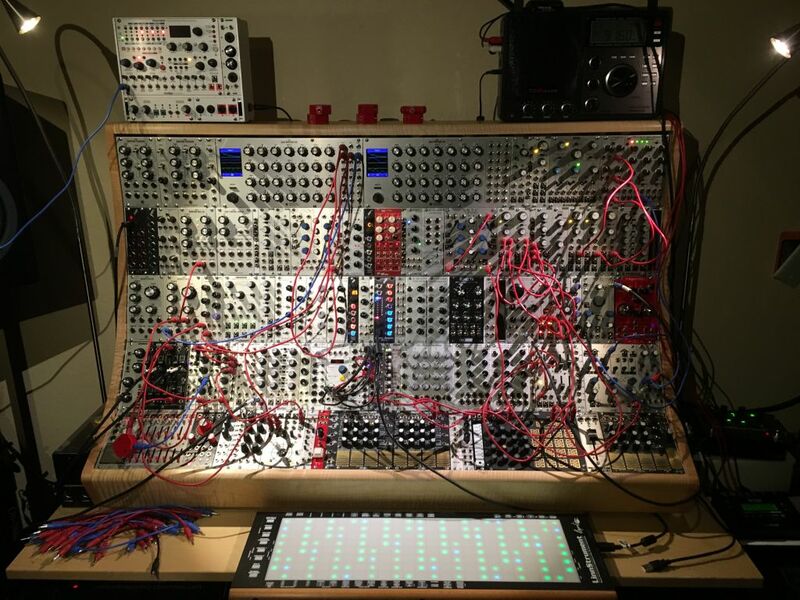 You're most likely going to discover that wringing your brain attempting to pre-decide over putting modules in a "logical placement" is a somewhat lost cause due to the nature of the immense flexibility presented by the modular synthesizer. That is, of course, unless you decide to follow the signal/work flow of most live performance synths. * The first picture is what the system looked like when I first built it. * The second picture is where the "Main Cabinet" is headed. 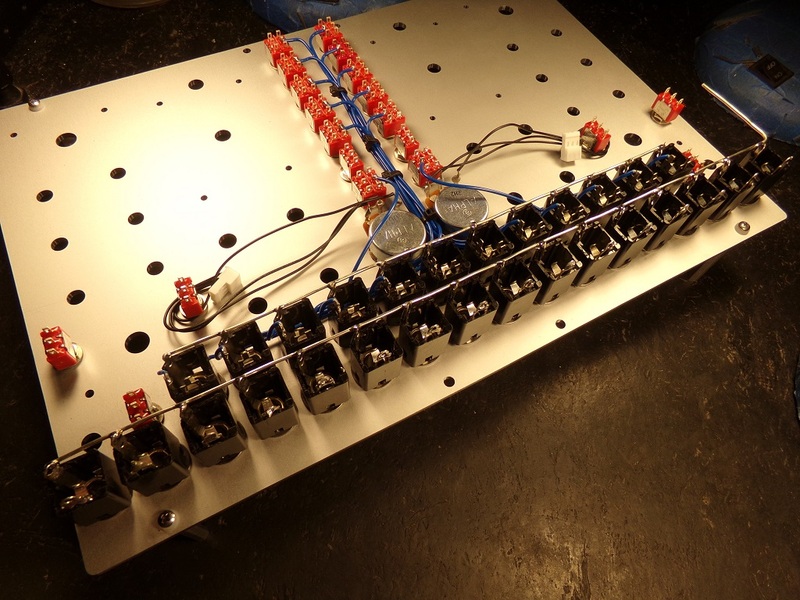 * The third picture is the "Modulation Cabinet" in mockup phase. 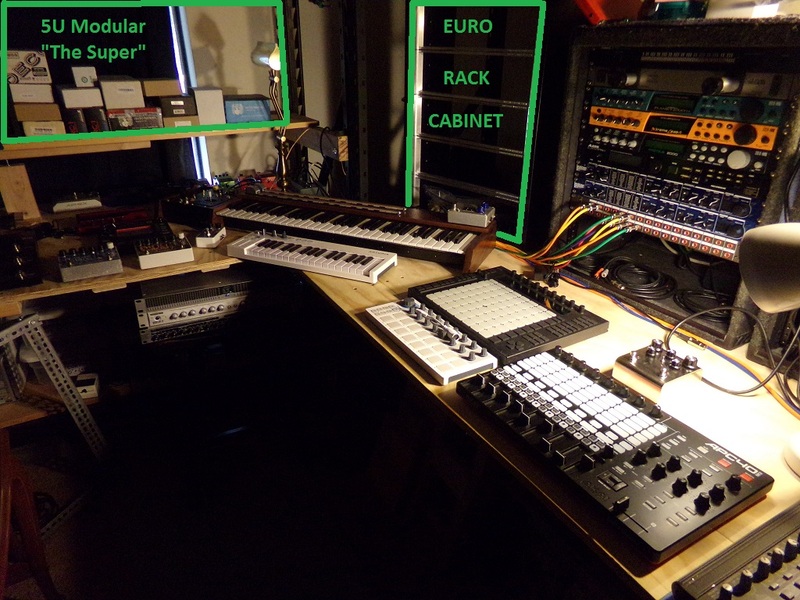 * The fourth and fifth pictures depict overall work flow, with the 5U "main" cabinet on player's left, and the euro "modulation" cabinet on player's right. However this arrangement is subject to change, and may very well do so. In my own situation .... I went with grouping the (4) VCOs on the upper row. 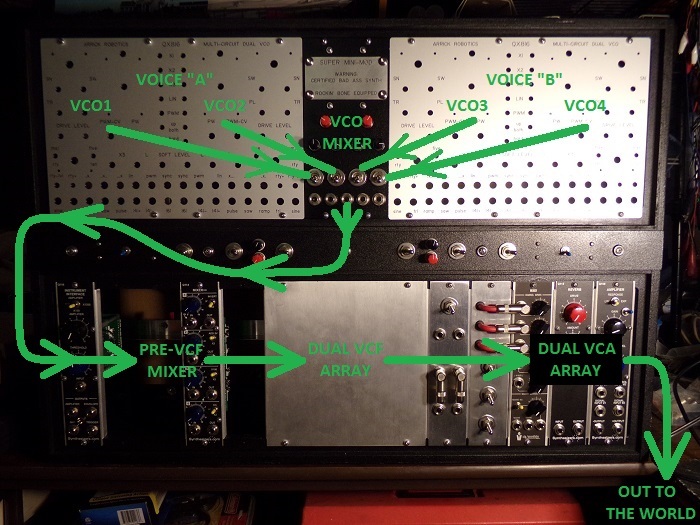 The VCOs are set up as dual pairs, each pair forming a two VCO "voice" with a 4ch mixer fitted between the two "voices". The signal is then sent down to the lower row, starting at the left side feeding a "pre-VCF mixer", then into a dual-filter array, then into a dual VCA output stage. 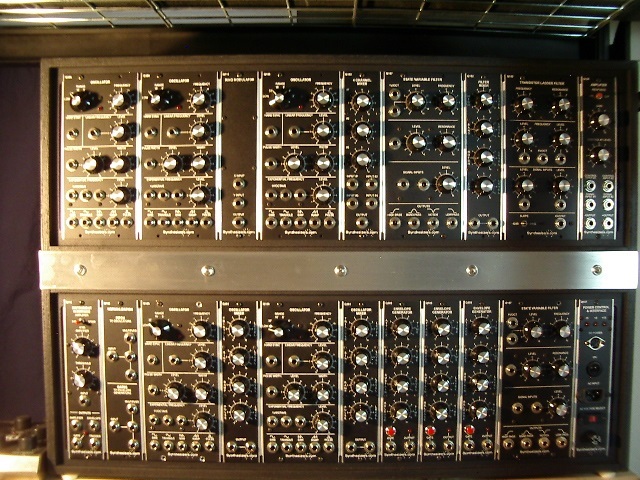 The mainstay of modulation modules are in Euro form and in an entirely separate cabinet (seen in the third image). 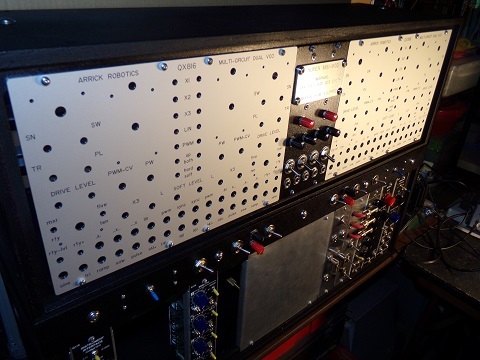 The two cabinets are connected together using "trunk lines", and all of the modulation signals are normalized to toggle switches in the custom panels using preconfigured routings. 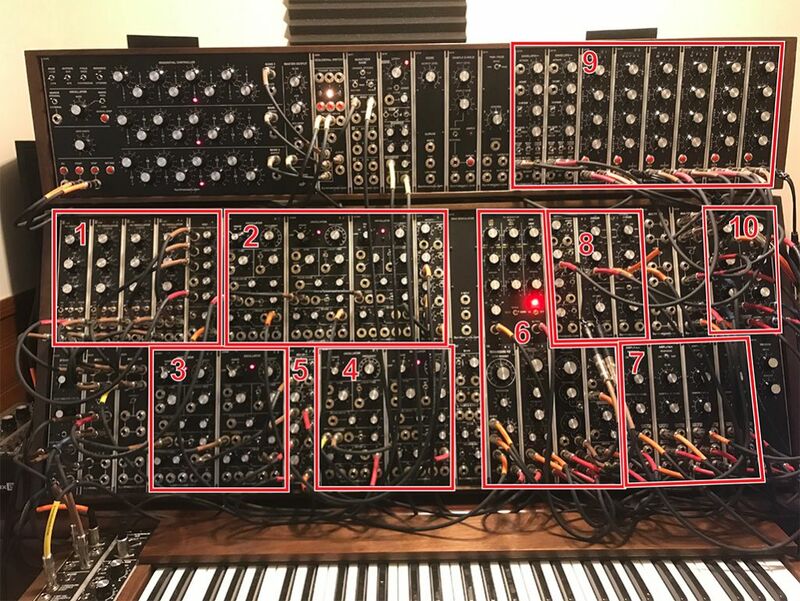 Keeping in mind that this synth project is essentially a semi-modular performance synth that may be used without a single patch cable. However every single patch point (factory stock I/O jack) still functions, with each jack having been replaced with switching jacks. That said, any of the normalized routings may be easily defeated by inserting a patch cable. So the entire modular functionality has been retained. Since the signal routings have been normalized into what comes down to the same old architecture used in performance synths such as the Minimoog, ARP Odyssey, Korg Mono/Poly (et al) it should be noted that what I've done here may not be what anyone else may want to do (architecture wise). 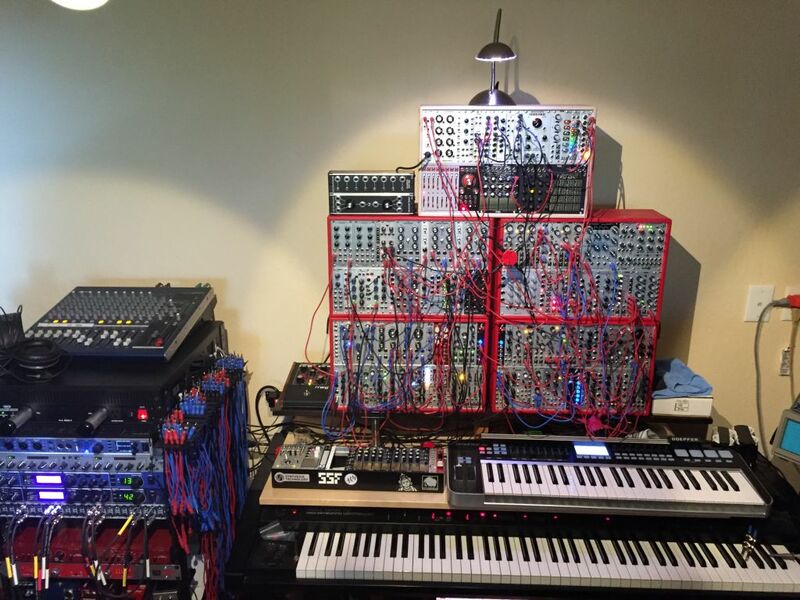 My point is that modular synths have no set signal flow or set architecture .... unless that is what is actually desired (as my project depicts). So working at discovering or creating some sort of "logical" grouping may prove to be a work in progress that will ebb and flow with time/use. Going from the first picture to the 2nd, 3rd, 4th, and 5th pictures was a process that spanned over five years. It took many hours of use and numerous reconfigurations to arrive at the finalized ideas and configuration. Probably the most common configuration .... is audio signal chain modules (VCOs, VCFs, Mixers, VCAs) are placed above modulators, gate-triggered modules such as Envelope Generators, and the like. It may be easiest to begin there, and then allow time and usage to determine how you prefer to set up signal flow and work flow. My bet is that both will change many times before you actually learn a few things about how you prefer to use your own modular synthesizer. The rest are utility modules and modulation sources. Your synth is just simply bitchin! Pretty much the same ethos I've adopted (without the one thousand hours+ of labor involved)! Just keep on keepin on with yo' bad self! Thanks, Rex. I freely admit to being much too lazy and inept with tools to ever attempt the kind of massive DIY project that you've thrown yourself into. Can't wait to see and hear it when it's finally done.